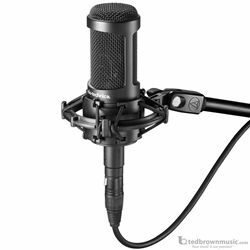 Designed for critical home/project/professional studio applications and live performance, this side-address cardioid studio condenser delivers exceptional detail and low noise. Equipped with a switchable 80 Hz high-pass filter and 10 dB pad, the AT2035 handles high sound pressure levels with ease. Along with its rugged construction and high-performance specifications, the AT2035 provides an exceptional level of consistency from model to model. It comes equipped with a protective pouch and a custom shock mount.